Louis Baratgin's unpublished Cartoon Review of the War lay hidden for some six decades until a portfolio of his drawings was discovered in a basement near Montreal. Drawn in the style of editorial cartoons they chronicle the period leading up to World War II and the war years until early 1943 when England's Eighth Army had turned the tide in North Africa. Baratgin doesn't flinch from the horror of total war, showing the price paid by civilians and military alike, but managing to convey the belief that the Allies would prevail. His characterization of the Axis is scathing-using humour and satire to mock Hitler and Mussolini. Although his cartoons were prepared for publication, we will never know why Louis Baratgin-who died in 1952-never saw his book in print. These cartoons are a remarkable portrait of a world at war. 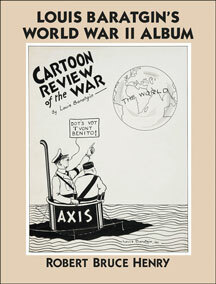 Robert Bruce Henry has written an introduction and a brief essay to accompany each cartoon. He identifies the major players, placing them in historical context and provides fascinating details related to the progress of the war, emphasizing the impact on Canada. Robert Bruce Henry is an archivist and freelance editor. He lives in Montreal, Quebec. 140 pp 10.5" x 8"